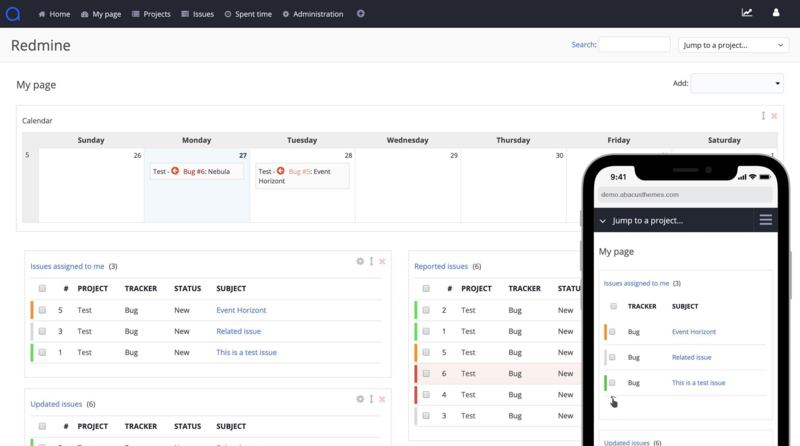 We created a clean user interface to make your work effective: added retina-friendly menu icons, "new issue" and "edit issue" buttons, simplified priorities, cleared issue tables and calendar, and much more. In just 1 minute, you can have the theme up and running. Just upload it on your server, choose it in the administration and save it. That's it! 1 minute and you can start being effective. This Redmine theme is now fully mobile, thus available on any device - desktop, tablet or mobile. We paid strong attention to mobile views so using our Redmine theme is flawless. Happy new year 2019 and a Redmine 4.0.0 update is here. Adjusted RedmineUP plugins, added new styles, general polish and we're good to go. We made a few of small fixes and updated RedmineUp Agile. Enjoy the theme! We implemented a new membership platform which is extremely easy to use plus there is a new credit card via 2Checkout payment method. No downtimes, no errors. Moreover, we are running on HTTPS. We are happy. Are you too?